YES, I’M STILL FREAKING OUT OVER THIS decision of cutting myself off from overseas travel—well … maybe not as much as I was when I first started thinking about this. I did promise two friends I’d visit their country … no, make that three friends … and now it looks like I’m going to have to renig on my promises. That’s something I seldom do. If I make a promise to do something, I like to keep it. But, sometimes, things get in the way … like finances—and, in the case of the three locations (India, Australia and Hong Kong)—distance plays heavily into the decision. I’ve been trying to figure out how I could physically manage about 18 hours in the air. With my body’s slow meltdown after October, 2013 (I’ve had good times and not so good times—I never know when each will hit), there’s no way. Finances … well, I could probably figure that one out eventually (pull from “Peter” to pay “Paul” …), but the time spent in the air is a biggie. Even for a trip to/from across the Pond. I’m not thrilled about the travel time required for my 2016 visit to the UK and beyond, but I’ve already committed myself to this trip. And if I do decided to go business cla$$ (haven’t decided as yet), it’s going to eat into what I will be able to afford in the future. A couple of friends have suggested to make the decision on a trip-by-trip basis: plan it, see how I’m doing … then if I’m doing well, make the commitment to go. If not, then … well obviously, don’t. Hmmm. I may have to take that under consideration. But in the meantime, I think … since I have time before my next big planned trip (after the 2016 trip … pattern is every two years or so), I think I will play with the shorter, on-my-continent trips to see how I do. There’s plenty to see in the States … and I have yet to make it up to Alaska, which is on my bucket list (actually, was on my husband’s list, too … and I still have some of his ashes destined for—hmmm … maybe Anchorage … or Denali National Park?) so, I’ll just have to see how that pans out. Right? Looking at things in the short term is appealing, too. Long range planning is hard. Doable, but hard. Planning ahead a week, a month … even a couple months out is so much easier. Forking out deposits nine-plus months in advance, then paying the balance six-months out (to get the best discounts) for the delightful Celtic Invasion Vacations tour does have it’s drawbacks. With closer to home, shorter trips, costs should be more manageable also, allowing for more travel (insert huge grin here). So, this is what I’ll do. For now. Hmm. Now, if I can just find the time … and solve Kaeli’s scrounging/scarfing issues, I’d be set. Well, folks, I’m back to diving into last minute planning and creating art for my upcoming—yikes! It is just over a month away—painterly exhibition at Open Ground Studios. Deadlines loom (Sunday!!). Prior to the opening, I’ll have all of the art documented and live on my SquareMarket website for those of you unable to make it to the event due to conflicts (excuses like distance or prior commitments are allowed—wink). Posted in "Travel Blog", Art, Books, Personal Musings	| Tagged Alaska, Art Exhibition, Australia, Hong Kong, India, long term vs short term planning, Open Ground Studios, traveling, What's too far? OH, YOU KNOW ME … WHEN I START TO THINK—well, that can be dangerous at times. Have you ever thought about something for a long time, but feared voicing the thoughts? I mean, saying them out loud? It’s different to keep the thoughts in your head … or even write them on “paper”. Well, at least for me … for some reason, something happens when I voice thoughts. It changes the purpose. The circumstances. I put a voice behind a thought a short time ago … and now I cannot get it out of my head. I love to travel. You already know that. I write about it all the time. I love Europe, Ireland, Scotland and … well, simply the idea of being over there, planning for the next adventure … then experiencing it. I love it enough that I’ve seriously contemplated purchasing a someplace to lay my head when I am able to visit. I put a voice to that several years ago. I actually started looking … seriously looking. Every time I was over there, I looked with the intent of finding something. I’ve talked to realtors, looked at ads, thought about consolidating into two small abodes so I could bounce back and forth whenever I could make it happen. Over the last year, I realized there were a few huge obstacles: 1) the cost of purchasing something—even renting a flat … or a room—would be very steep. 2) as long as I had critters, it wasn’t going to happen. My forever critters. I cannot justify giving them up just so I can travel for extended periods—nor put them into quarantine (“jail”) for months on end just so I can take them with me. And there’s no way I’m going to leave them behind to live abroad. All of that would be too selfish. Lest I forget my loving pet sitters—I cannot impose on them for repeated long stretches of time … so I figured, I could wait till the pets passed over the Rainbow Bridge. 3) then another realization hit me … as I wait, my health seems to be deteriorating to the point that these transcontinental flights are taking a heavier toll on me with each trip … what shape will I be in once I am pet-free? I’m already contemplating moving up to business class so I can more comfortably make this next trip. That’s a heap of money spent just to get across the Pond. That in itself is a huge negative for me. I like to make the air fare and room as inexpensively as possible so I can use my funds to explore. So, another thought started pinging around in my head—one I kept stuffing, because I didn’t want to consider it. Logic and common sense kept dredging it back up. The thought I recently voiced was to make this 2016 trip my last trip abroad. Once voiced, the idea grew. Stop flying across the pond and instead, put my time and effort into visiting places within the confines of this continent. I didn’t like the sound of that at all. “Confines…” was the key word. But I cannot make it go away. I love traveling so much—and the draw of Ireland and Scotland is strong. I just don’t know. It’s hard to imagine not traveling. In a way, I’m in mourning … it saddens me thinking that 2016 will be my last foray traveling abroad—traipsing amongst the trees and trudging up hills with hidden secrets … and experiencing the ancient ruins of our past. 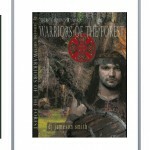 The States—and that which lies north and south of me—may be old, but Europe and the British Isles are ancient. I have fallen in love with ancient. I adore ancient. It pulls my mind away from the present, planting me deep in to the past of oh, so long ago. My imagination seems more alive as I wander over there. To think that I won’t be visiting any of these lovely places anymore leaves a huge hole in my heart. What am I to do with this quandary?? My heart is aching over it. I cannot see a resolution in the near future, yet … I really must decide. 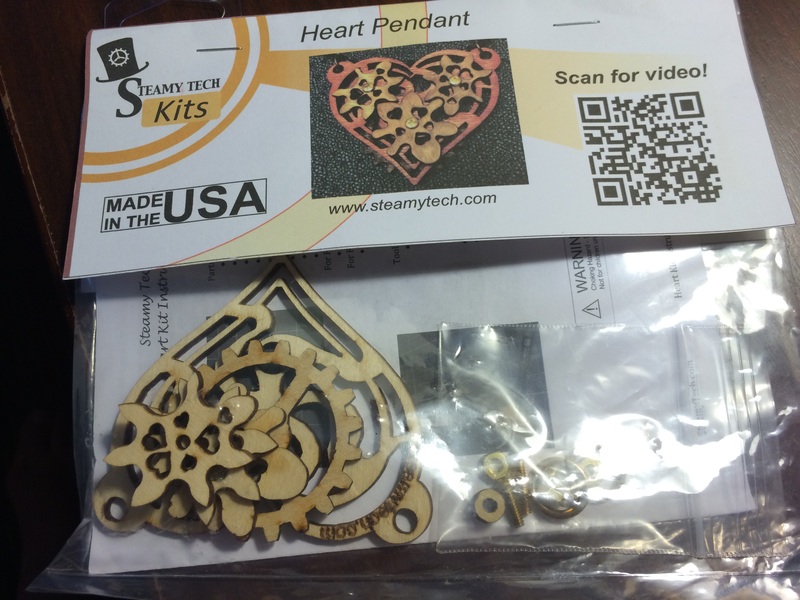 Steampunk … Here I Come! AAAH. 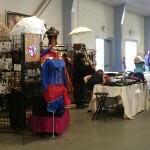 IT WAS A “QUIET” … YET BUSY WEEKEND for me—and my friend, Pam—as we made our way (separately) to the outskirts of Turlock for the steampunk conference. About two hours from home, Turlock is nestled between Modesto and Merced on Hwy 99 (which is east of Hwy 5). It really is a beautiful drive, if you like the stark beauty of naked mountains (which I do). Not one green blade of grass or leaf anywhere … well, except in the almond groves or other cultivated produce. The shadows played beautifully with the curvature of the mountains and hills, creating some lovely contrasts. Unfortunately, I was “driven” to driving to my destination … and did not stop—not even once (unusual for me). I did not bring my good camera (foolish! ), so was not as inclined to stop. I just visually soaked up all the undulations and shadows and stored them in my (faulty) memory. I believe this drive needs to be done again, without a destination or deadline planned so that I can stop at a moments notice … on a whim … and take photos. Because of our allergies, as the time drew near both of us were concerned about air quality due to the fires blazing in surrounding areas. Fires were out and beautiful, clear skies greeted us—thankfully! And, although it was much cooler weather for locals (they’d been suffering with 116° heat until recently), the 89° was a bit toasty for us—especially in costume. Thankfully, it continued to cool down a wee bit more over the course of the weekend. But was still too warm for me to wear either the London Fog rain coat or the knit shell sweater—or even the 4th doctor’s beautiful trademark scarf for any length of time—to complete my Sarah Jane Smith costume. Oh, well. I arrived at the hotel and unpacked before heading over to the Stanislaus Fairgrounds for the convention. Nice accommodations at the Comfort Inn at the convention rate. Yay! I had less than an hour left before they closed down for the night, so I simply drove over, picked up our passes and meandered through the venue to see what was there. I had to remind myself that it was their first year and it should grow quickly, so it was nice to see it in it’s “infant” state. 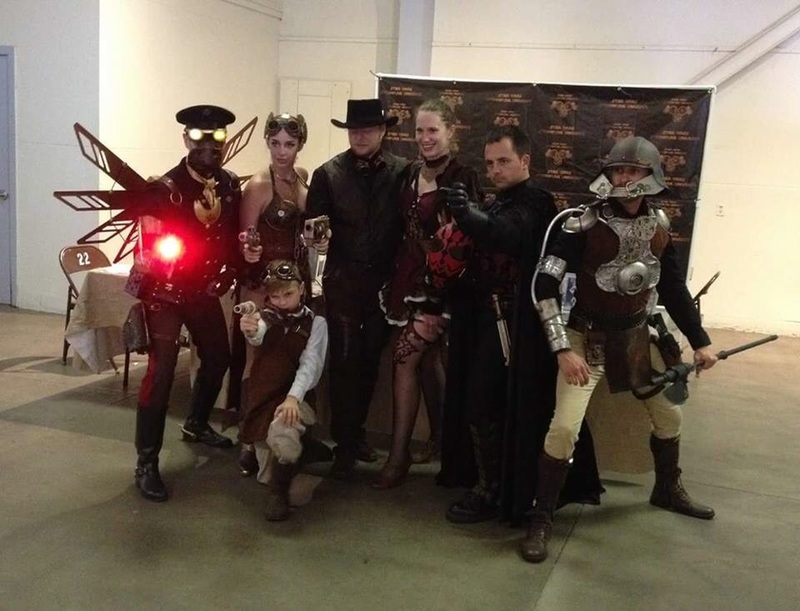 Courtesy of Pam Leja, a nice shot of the steamy Star Wars Steampunk crew. crew. Star Wars Steampunk. They even have permission from the creator to use the Star Wars name! There was a video producer—though I was not interested, so I cannot tell you what he was trying to sell. It was fun. I did have my cell phone camera, but found that I was having too much fun poking around and asking questions to be bothered with many photos. When I looked at the ones I did take, I had to shake my head. Mostly generic, vanilla shots! I’m embarrassed! 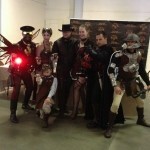 Costumes, accessories, clockwork gearing were only a few things you might find. The nice thing about new venues … they are small, not as well attended (which is a bad thing for the vendors), but it allows more time to chat. This group of vendors was delightful … talking about their wares, about little things—and I found two from my area … plus, the whole affair was far more intimate. That’s a good thing for a first-timer like myself. I had misgivings about attending, but shouldn’t have worried. The intimacy of the venue gave me time to warm up to the cool things I was seeing. And gave me ideas on how I could better steampunk my character for next time. Yup … there will be a next time if dates don’t conflict with my schedule. 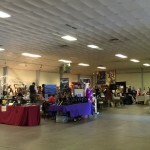 It’s a large space and in the future, it will be packed with vendors and attendees. investigating what was available, chatting up the vendors. We even went into the next building where there was a holistic/crystal show going on (spend very little time there) … and we had a lovely lunch from the catered trucks (no “roach coaches” here—gourmet food, indeed!). Some came as far a San Francisco to cater to the crowd … including a cupcake truck from San Jose. 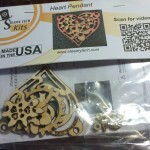 Movable gears on this sweet little pendant. May work it onto K9 to Steampunk him a bit more. 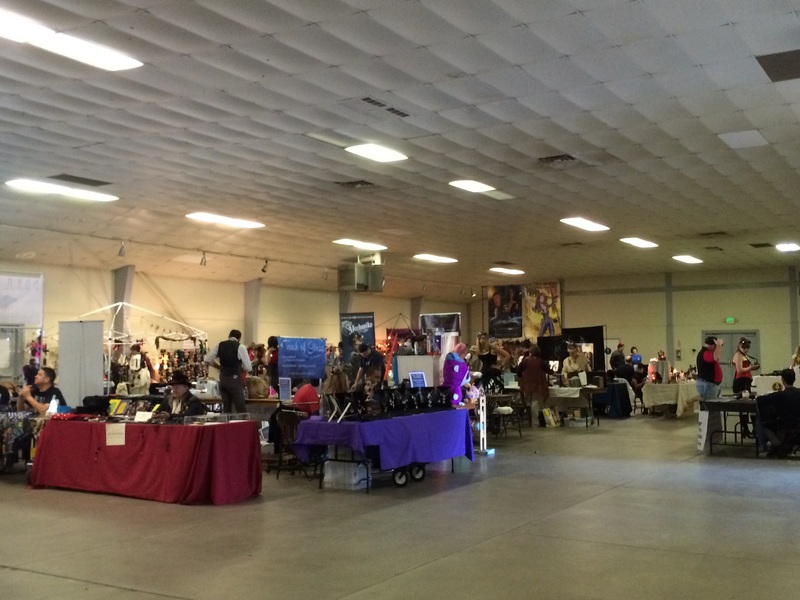 Sunday, we came back over to the convention to find that many of the vendors had abandoned the show (remember … sadly, low attendance can mean low income for vendors). I had hoped to find a few things to buy, plus get permission to take a few photos. Oh, well. 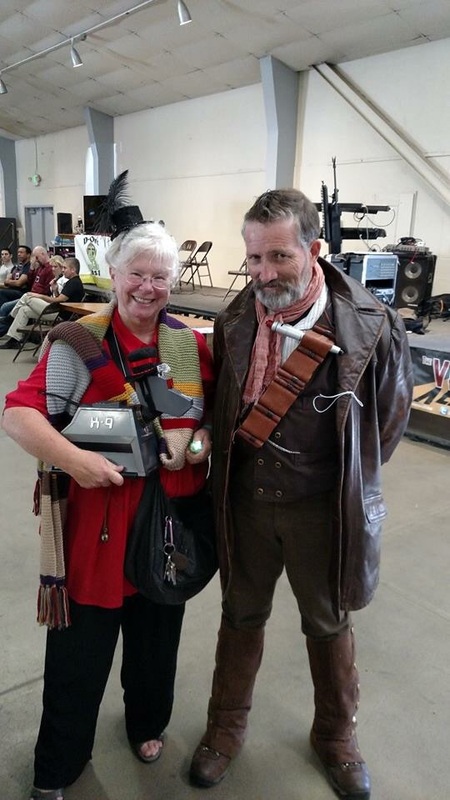 I did get a photo of me with the War Doctor and my dinky little K9. My little guy was quite a hit, by the way! Everybody wanted pictures of K9 with or without me. That made me happy. I even got a few compliments on my costume. Pam, on the other hand, had plenty of compliments … but then, she definitely dressed the part. I was going to add more photos … but for some reason, they load into WordPress sideways (tried rotating the originals, but it was a no-go—insert extremely grumpy face) … and unless you’re game with side-ways photos, I’d rather not add them. They were so cute! 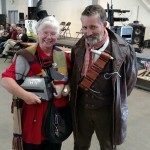 One of K9 with his Steampunk hat and one of Pam with a few nicely dressed Steampunk vendors. Drats. So, folks … it was quiet, but fun. 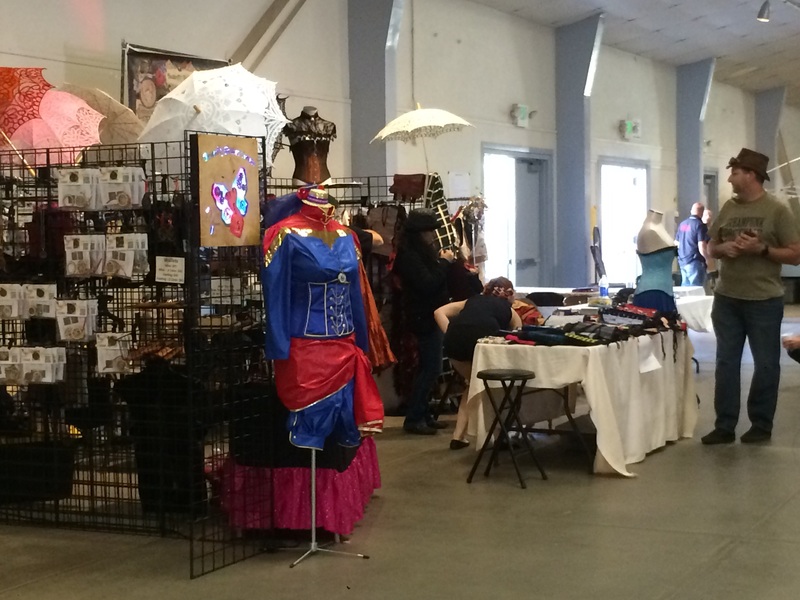 Lots of cool outfits that I managed to not take photos of … good food and fun, chatty vendors to pass the time of day. It does sound like the date is set now in stone for next year … and it’s the same weekend, so I won’t be able to attend—prior commitments at the Big Trees Scottish Gathering and Highland Games in Ben Lomond CA with the Gunn Clan tent will keep me away—always on the first weekend of October … sigh. Now … a quick apology for the monster-long blog entry, then I’m off to prepare for the book signing that’s happening Saturday in Salinas! Have a great Friday plus a beautiful and blessed weekend, folks. Until next Friday … cheers!